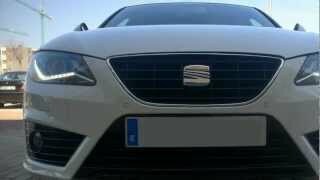 SEAT Exeo 2012 gets a facelift with the new bi-xenon headlights and stunning LED daytime running lights and gets a new smooth, efficient Multitronic auto/sequential manual gearbox. The styling enhancements, boosted by smart new alloy wheel designs, further underline the high value Exeo range’s premium look, while upgrades to interior materials – including upgraded leather on the steering wheel and revised upholstery – create a matching premium feel. The 2012 Exeo will make its public debut at the Frankfurt Auto Show next month. SEAT’s much-admired executive class Exeo saloon and ST estate range is getting a new look, and some important new engineering upgrades. The revised Exeo ‘face’ with new bi-xenon headlights and stunning LED daytime running lights (standard on Sport, optional on SE), will make its public debut in the metal at the forthcoming Frankfurt Motor Show. The styling enhancements, boosted by smart new alloy wheel designs, further underline the high value Exeo range’s premium look, while upgrades to interior materials – including upgraded leather on the steering wheel and revised upholstery – create a matching premium feel. Meanwhile, improvements to the high quality SEAT saloon and estate’s 2.0 TDI common rail powerplant now see emissions cut to as little as 129 g/km*.Economy is similarly improved, too, with the Exeo saloon now being capable of as much as 57.6 mpg* on the EU’s combined cycle. The latest upgrades to the Exeo come hard on the heels of the arrival of a new gearbox option earlier this year, with the addition of a smooth, efficient Multitronic auto/sequential manual gearbox further underlining the luxurious SEAT’s executive appeal. The Multitronic ‘box – with its CVT-based technology and stepped ‘changes’ – offers both full auto mode and the option of sequential shifts via the sporty, steering wheel-mounted shift paddles. Looking to 2012, the Exeo family is in for further upgrades with the addition for the first time of SEAT’s effortless Start/Stop technology on an Ecomotive model, which will help deliver even more fuel efficiency. SEAT is targeting an ambitious CO2figure of less than 120 g/km for the Start/Stop-equipped Exeo which will, of course, enhance its appeal to both environmentally-conscious private buyers and UK fleet managers who demand such low emissions levels from even their executive models. The Exeo’s eye-catching styling changes, allied to SEAT’s ongoing commitment to improving quality while simultaneously cutting its cars’ emissions and improving fuel economy, are sure to generate further interest in the range – which is now the Spanish brand’s third best-seller in the UK behind the Ibiza supermini and sporty Leon five-door family hatch. 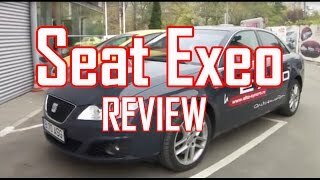 Acknowledging that the Exeo upgrades will boost both the emotional and rational appeal of the range, SEAT UK managing director Peter Wyhinny said: ‘The arrival of the Exeo marked SEAT’s debut in a new and hard-fought market segment, and the success of the fleet-friendly saloon and estate range is already clear. The Exeo range, which is today offered with a choice of three frugal turbodiesels or one potent turbocharged petrol engine, is priced from £19,285.